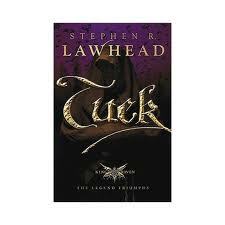 Although entitled “Tuck” this final installment of the King Raven trilogy isn’t narrated from the character’s point of view like it was in “Scarlet.” Where in that novel Will Scatlocke was directly relating his misadventures to the monk/scribe Odo while he was imprisoned, here the story takes place vaguely from Friar Tuck’s perspective and highlights his influence in the conclusion of the conflict that began in the first book of the series. I always enjoy Bran’s plots and clever disguises. This character is fearless and gets away with quite a lot, but there is always just the right balance of success and failure. While one scheme goes to plan flawlessly, something new and unexpected might pop up. Bran is a quick thinker, and always manages to come up with something even when the situation seems impossible. I admire that about him and it makes him a good leader. The conflict between Bran’s band of rebels and the Ffrenc continues to escalate and in the process there are a few casualties. I have to say I didn’t entirely agree with the author’s choice in the death on one character in particular. I thought it was just needlessly tragic, despite not being a main character. I suppose without a few losses, it wouldn’t be sufficiently realistic, but I still didn’t like it. Casualties and all, I did still liked the ending. There were a few unexpected twists, although I did guess one of them, so maybe it wasn’t hugely unexpected, but it was enough to keep things interesting. With the epilogue, the author finally ties the Robin Hood myth to Sherwood forest and wraps up the whole trilogy quite nicely. It seems I liked these books more than I realized, because now I find I’m a little sad that it’s over. This series slowly snuck up on me in a way. When I first started reading it, I didn’t expect too much to be honest, but Bran’s righteous quest and band of wily Welsh rebels really grew on me and I think I’m going to miss them.